I work with a lot of families here in Myrtle Beach. The families I photograph on the beach vary in size from young families of three up to large groups that sometimes include up to 30 people. As a family photographer who has over 10 years of full time experience, I've learned a lot over the years. It can be stressful to some families to think of getting everyone together for a professional portrait session and I totally get that. This especially applies when there are small children involved. First, you have to choose your photographer and location, then the outfits you'll wear, and convince everyone to cooperate. It's a lot to consider. However, it really doesn't have to be that stressful. Your photographer will guide you in choosing the best location to fit your needs, family situation or style that you want. A good photographer will even help you with outfit selection with tips or by even sending you pinterest boards to inspire you. 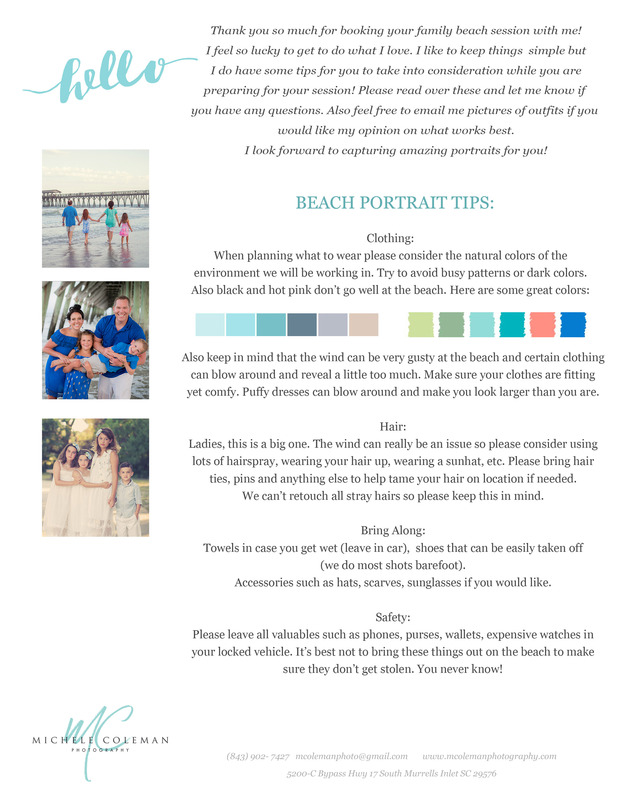 Here's an example of a beach portrait tips guide that I created for my clients. I've put together 5 Ways to Have a Successful Family Beach Session (based on my own experience, business model, and interaction with clients) in hopes that it might help you take some of the pre-session stress away and also help you prepare for your shoot. 1. Remember your WHY. Why are you having these professional portraits made? For most, the answer is almost always going to be for memories. Your goal is to have beautifully captured moments with and of your beloved family members and children. Portraits that will last forever and showcase the lives you lead. Let that reason be the guiding factor in all of the choices you will make while planning for your photo session. Remember it's about LOVE, laughter, fun, and memories. Sure, you want to walk away with the most beautiful images possible, but also keep a light heart and try to remember that every last detail doesn't have to be perfect because your love of family is what is perfect. Sometimes young children or even moody teenagers might not want to look at the camera or smile their real smile but eventually, through patience and creating space for them to just be themselves during the shoot, you may end up getting them after all. Take the pressure off of them, and yourself to be perfect. 2. Outfits are important. Choosing them is a strategic step in the process. I've seen people go too far out on what they wear for photos, to be point that nobody is comfortable enough to enjoy themselves or move freely, and I've seen the complete opposite. Perhaps not thought out enough clothing. Aim for the middle. Don't be so formal with your clothing choice that you or your children are confined to certain poses or can't move about freely and have fun. Pay attention to how each person's outfit compliments (or clashes with) other family member's outfits. Your entire family group should be wearing clothing that flows together. For beach portraits, you don't always have to wear summer clothes either. If your kid loves hoodies, bring one along, as long as it's not 100 degrees of course. 3. Choose the right time of Day. There are generally two main options for portrait sessions on the beach. Those prime times are within an hour of sunrise or sunset. This is because once the sun comes up over the beach, the sunlight is very harsh and there obviously is no shade at all. The lighting is softer and more flattering at the prime times. So how do you decide which time of day is best for your family portrait session? A few things to consider are getting up very early for a sunrise session and if that will work for your group. One great perk to getting up early and having your session done first thing in the morning is that you have the rest of the day free! If you have small kids, are they better in the mornings as opposed to late evenings? I've found that sunrise works much better for some children. Sometimes by the evening they are tired and their attention span for the day is gone. Unless you plan an uninterrupted afternoon nap a few hours before the session. Sunrise on the beach produces an awesome look for your portraits, especially when we capture the sun coming up over the water in the background. Evening time is kind of magical in my opinion. I love the golden sunlight right before sunset. Here in the Myrtle Beach/ Grand Strand area, the sun sets opposite of the beach, basically on the dunes side. This creates a unique opportunity to get beautiful back lit sun kissed images from certain angles. Sometimes the natural light is so perfect in the evenings that I shoot without a flash or off camera light. As long as everyone isn't super tired from the day's events or you have someone who needs to be in bed early, evening might be the perfect option for your family. 4. Do the Must- Have Poses First. If your dream is to get one perfectly posed shot of the whole family smiling and looking at the camera, do that first. A good photographer will know to do this already. You need to get those shots before the kids lose interest or before Grandpa gets grumpy, lol. You might also have a mental list of other posed shots that you would like, for instance, Mom and daughter, Father and son, just the kids together, grandparents with grandkids, etc. It's important to get this list of must haves done as soon as possible. Once they are accomplished it also takes some of the pressure to "get it right" off and everyone can relax and be themselves more for the rest of the shoot. 5. End it with a Little Fun. Now that all the important traditional shots are out of the way, let's have some fun. This is where the magic happens. It's time to get candid, be be silly, play in the sand or water or walk together down the beach. When I photograph children on the beach, the end of the session is my favorite. Some of the best images I capture are during the non posed portion of our session. Ending it with fun will also leave everyone feeling amazing and glad they sacrificed an hour of their day to the experience. It is an experience, after all. One that yields invaluable results. Amazing images of the people you love, in a relaxing place you love, to cherish forever. I hope you found these tips useful and that you'll consider getting in touch for your Myrtle Beach family photography needs. Click here to email me.